Can it be Monday already? Or am I still in recovery from seeing “Piranha 3D” on Friday? (More on that later.) 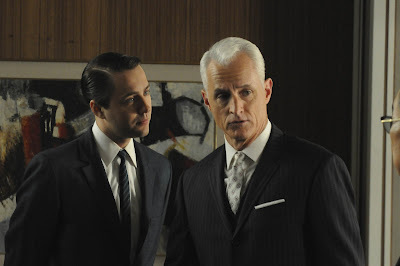 Anyway, over at Sterling Cooper Draper Pryce Campbell — sorry, channelling Pete there for a second — last night, Roger’s past threatened his present, Don finally seemed to get back in the game (the ad game, anyway — his personal life’s still a mess), and poor Sally, whether or not she did what a pair of hysterical moms accused her of doing, is in the ten-year-old equivalent of a downward spiral. Betty the villain is back, furious at Sally for cutting her hair (yet another bid for attention by a neglected child who, sadly, wants to “look pretty”) and for “playing with herself in public” (which she certainly wasn’t doing — not in public, anyway), but really furious at Don. (The latter Sally subplot struck me as Weiner pushing the envelope perhaps a little too far.) “I want him dead” Betty fumed to Henry, who was surprisingly reasonable about Sally. Anyway, the ten-year-old’s off to therapy, accompanied by a silent but sympathetic Carla (would someone please give her some lines? ), to deal with her own past. Maybe Roger should go too.